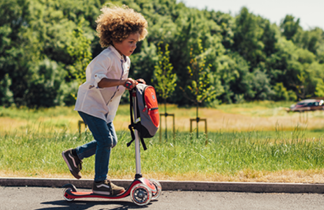 As your little ones embark on their first scooting experience, Plum® understands that you want a scooter that will guide them through the process and build confidence on the way. A three wheel scooter will provide a more even, stable ride until your child gains balancing skills. The three wheel range includes a patented steering lock feature that prevents the wheels from turning for easy learning.